« Massage and Prostitution-What’s the Difference? Each month at the Working Well Massage chair station inside the Lincoln Park Whole Foods Market, we feature a different body cream or lotion that is great for massage and your body! This month, our massage therapists are applying Vanilla and Sweet Orange lotion from Hugo’s Naturals during our massages. Hugo’s Naturals make great hand and body lotions. They are also good for relaxing or Swedish massage or even an at home back rub you give your partner or children. Who is Hugo and How Natural Are His Products? According to Hugo’s blog , Hugo Saavedra, founder of Hugo Naturals, has always been passionate about seeking out the best, most unusual ingredients and combining them in unique and exciting ways. His business career began at age 11, in Buenos Aires, Argentina. A ship hand gave Hugo a branch of bananas at the port dock and on his way home, a woman stopped her car and asked how much they were. An entrepreneur was born. After years of running restaurants and supplying organic herbs and edible flowers from Argentina to the U.S., Hugo’s love of organic produce and exotic herbs spurred him on to his next venture — a line of exquisitely crafted soaps, which he sold at Farmer’s Markets along side his exotic produce. The demand for the soap was overwhelming, and soon outstripped his farming business. Hugo expanded the line to include lotions, body scrubs and bath salts. These products developed a large and intensely loyal following and Hugo expanded his sales beyond the United States into Asia, Canada and Europe. Hugo has taken great care to create the most beneficial products possible, while retaining a feel of luxury and comfort. 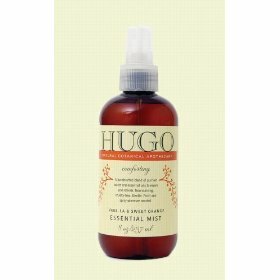 All of Hugo’s products are earth-friendly and utilize organic ingredients. Using a cornucopia of natural ingredients, Hugo has created a banquet for the skin with the same sure hand that once created prize-winning culinary dishes. Hugo Naturals is a true expression of the creativity and integrity of its creator. Where Can I Buy Hugo Naturals’ Lotions? At Whole Foods Markets of course! Right now a 12-ounce bottle retails for $12.99 at Whole Foods Market. However, if you want to buy online, you will have to pay extra for shipping. Buy Hugo’s lotion from Amazon here. Read more about Hugo’s Naturals and Whole Foods body care products from Meg at her blog: Meg’s Makeup Reviews here. Note: Working Well Massage and Sue Shekut are not affiliated with Hugo’s Naturals nor do we get any advertising dollars from blogging about the products. We simply want to share a great product with our readers!